Buying a car is a big deal. Like buying a house, it is an investment that will be part of your life for a long time. Whether you are looking to upgrade, buy your first or even third car, it’s important to know exactly what you’re getting. For total confidence in your vehicle purchase, we wanted to delve into the benefits to buying a New Car. When you buy a new car, you are in control. Whether you want a sporty new Ford Focus, or an adventure-ready Ford Everest, it’s all about choosing the features and extras to suit your individual lifestyle. To make your new car your own, Ford also has a huge range of Genuine Ford Accessories. From a steel Bull Bar and Carry Bars or LED Lights and Tray cover, there are dozens of accessories for your new car. Plus, when you order your accessories when you purchase your new car, your vehicle will be delivered with everything already installed and ready to go. Buying a new car means that it’s completely yours, no one else has sat in the driver’s seat or spilt their coffee on the floor, it’s brand new and comes complete with that new car smell too. New cars also come complete with a comprehensive new car warranty for total peace of mind. When you buy a new Ford, you’ll receive Ford’s 5-Year unlimited kilometre Express New Vehicle Warranty as standard. This new car warranty covers the event of failure and defects during the warranty period, ensuring your new car is protected. As well as protecting your new car, any genuine Ford accessories you buy with your new Ford are also included within your new car warranty. With automotive safety and technology continuously improving, when you buy a new car, you can be confident it has the latest features to assist your drive and keep you as safe as possible on the road. Ford engineers are constantly devising smart solutions that redefine what a car can do. When you buy a new Ford, EcoBoost for extra fuel efficiency, Blind Spot warnings, Rear Parking Sensors and Camera and Active City stop are only a few of the optional features available. Finally, when you buy a new car from a dealership, it comes with a guarantee of quality. 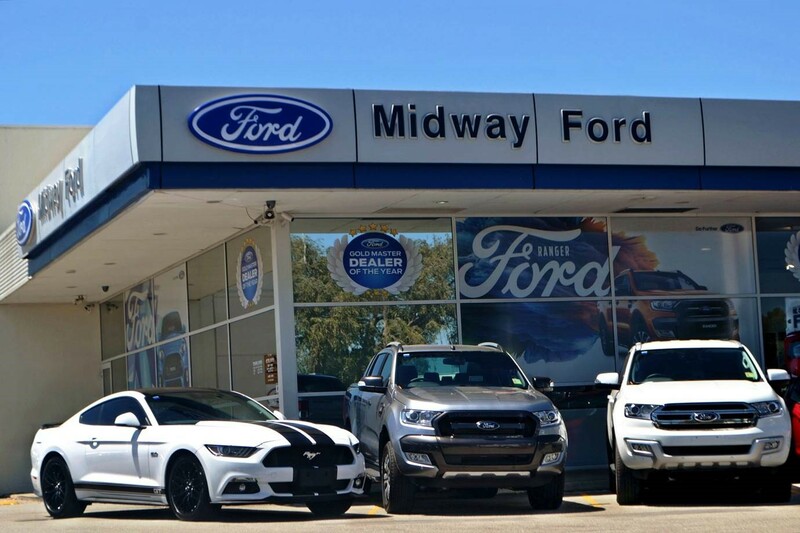 Buying a new Ford from Midway Ford means that you are buying a vehicle from a dependable and trustworthy dealership who has been established in the Midland community for 50 years. As an independently owned and family operated dealership, our knowledge and experience of the Ford brand and motor industry ensures that we provide only the best for our customers. When you buy a new car from Midway Ford you are welcomed into our family, and we are here to assist you throughout your entire journey. If you are interested in purchasing a new car and would like assistance finding the right one for you, please don’t hesitate to Contact our friendly team of experts today. Alternatively, feel free to visit our Midland Ford dealership and meet the team in person!